The 2017 Glasurit EDUCATE graduates received their graduation certificate and class of 2017 jacket in a ceremony held at the Glasurit Refinish Competence Centre. With four graduates in 2017, the successful program continues to provide the body shop repair industry with qualified apprentices who go on to become valued spray technicians. James Green, Glasurit Trainer for BASF Australia Ltd presented the graduates with their certificates and awarded three of the apprentices with awards for their outstanding work and attitude. Joshua Baldacchino from Canterbury BMW was awarded Recognition of Achievement, “Josh has a high skill level and is very particular about the work he does” said Green, “he takes pride and care with his work and has a calm approach. He is well liked by his peers and his great attitude at the Glasurit Refinish Competence Centre is reflected at the company he works for”. In 2017 the Glasurit EDUCATE apprentices have practised their skills on vehicles instead of shells, enabling them to give the full customer service experience when refinishing a vehicle. “This year the apprentice’s application skills were already high, so we focussed on taking pride in their workplace, and as always had a strong emphasis on safety. With the live work there was a strong focus on efficiency, time management and ownership of process and the final product” said Green. “The most rewarding skill to me is the attitude of the Glasurit EDUCATE apprentices and the confidence that they take back to their places of employment”. Prospects in automotive refinishing are broad, and apprentices could find themselves working in the future as body shop managers, at an OEM or as technical representative, colour designer or teacher. “BASF is committed to supporting careers in the automotive industry. We aim to attract talented, ambitious people and give them the skills and processes needed to be successful in today’s increasingly sophisticated and competitive industry,” said David Handcock, Technical Sales Support Manager at BASF. Jason Trewin, OEM & Operations Co-ordinator for I-CAR Australia, awarded the graduating students with a certificate to recognise the training that each apprentice has undertaken. This certificate is recognised by the industry, insurers and repairers and will be maintained if each apprentice continues their education in the industry. Since the introduction of the Glasurit EDUCATE program 60 students have entered the program with 30 graduates. The education at a premium facility with a premium brand has contributed to the success of students competing at the recent Regional WorldSkills event. Three of the top four winners were a part of the Glasurit EDUCATE program. 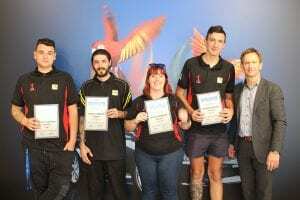 The winner of the Regional Worldskills event, Maxine from Gemini Campbelltown, won the vehicle painting challenge at the Sydney West Region WorldSkills Competition and now goes on to compete at the National WorldSkills competition in Sydney in 2018. For more information about Glasurit EDUCATE contact James Green, Glasurit Trainer on (02) 8787 0656.